Today we are going to see the best knee cut pass by Lucas Lepri. I am at his Brazilian Jiu-Jitsu & Fitness Academy located in Charlotte, North Carolina. I came here to train with him to prepare for the Worlds 2017 tournament. 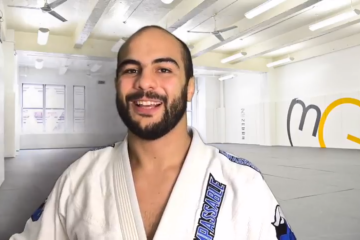 In my opinion, Lucas is probably the best light-weight competitor in the history of jiu-jitsu. He is a 6-time black belt world champion and has won every major jiu-jitsu competition in the world. In his last 2 competitions, the Pan Ams and the Worlds no one scored a point against him. This is an amazing accomplishment considering those are 2 of the toughest tournaments in jiu-jitsu and he was fighting in the light-weight division which is regarded as one of the toughest and most technical divisions. 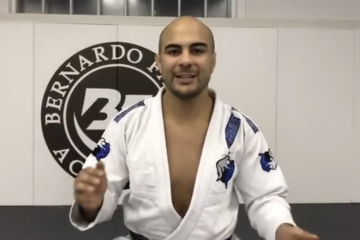 He is very well-known for having one of the best passing games in BJJ, especially his knee cut passes. I always encourage grapplers who like the passing game to watch and study him. Let’s see how he does his best knee cut pass. This technique usually comes when his opponent has him in the de la riva guard. Lucas controls his opponent’s collar on the same side that his opponent is playing de la riva guard. Now he lowers his stance and uses the collar control to raise his opponent’s back off the mat. He closes his elbow and that releases some of the pressure from his opponent’s de la riva guard. He doesn’t start the knee cut pass until he has done these steps. Lucas now controls his opponent’s pants around the knee and pushes his leg to the mat. At the same time, he pulls the collar to force his opponent to his side. It’s very important to keep his opponent’s back from being flat on the floor. He maintains a tight position and keeps his elbow tight to isolate the leg and prevent his opponent from getting into a knee shield position and block his pass. By pushing his opponent’s leg down, it prevents him from going to the reverse de la riva. Once Lucas lowers his upper body his opponent starts to frame. He switches his grip from the knee to his opponent’s same side elbow. This allows him to control this shoulder as well. Now he leans forward and starts to cut his knee. His goal is to touch his knee to the floor. He doesn’t like to slide his knee because it creates too much space for his opponent to recover guard. Now he puts his knee close to his opponent’s ribs then he pivots on his knee and completes the pass. When his opponent tries to escape he just follows him. The second scenario with this knee cut pass is when his opponent gets the knee shield after framing. All the steps in this situation are the same but now Lucas has to deal with the knee shield. At this point he switches his grip from his opponent’s knee to his elbow as he did previously. Next, he pulls on the arm and pushes on his opponent’s chest using his collar control. He also brings his knee to the middle of his opponent’s hips. He does this in order to point his opponent’s knee straight up. Now he closes his elbow to isolate the leg and starts the knee cut pass again. It’s always interesting for me to see the different details high-level grapplers use with their techniques. However, Lucas uses so many different details with his knee cut passes and his timing is perfect with each detail. That is the key to his amazing passing game. For example, the knee shield position is one of my favorite positions. However, when he brings his knee to the middle of my hips and forces my knee straight up, it completely kills my knee shield and he can start the knee cut pass again. He controls his opponent’s collar and lowers his stance. He closes his elbow to help release the pressure from the de la riva guard and bring his back off the floor. Next he grips his opponent’s pants around the knee and pushes that leg to the mat while at the same time he pulls on the collar to force his opponent to his side. Now he lowers his body and his opponent usually starts to frame. Lucas switches his grip from the pants to his opponent’s elbow. He cuts his knee to the mat and pivots to complete the pass. I hope you enjoyed the video. Thank you Lucas for the awesome technique. Oss.